1. 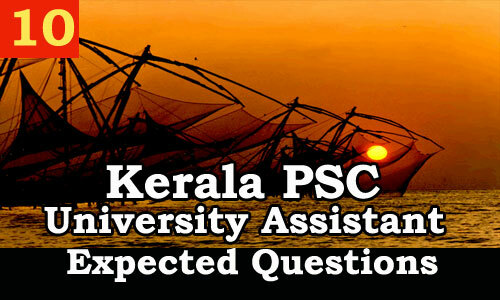 The first election to the Kerala Legislative Assembly was held in which year? 2. Vaikom Satyagraha was organized by which organisation? 3. The largest geographical region in Kerala? 4. In which district the famous Malayalam poet Uiloor. S. Parameswara Iyer was born? 5. The Zamorin King who was the exponent of Krishnanattom? 6. The first malayali woman to become Governor of an Indian State? 8. The aim of Information Kerala Mission is to promote? 9. The first woman Chief Justice of the Kerala High Court? 10. The first person in Kerala to write Sanskrit Drama? 11. In which district is Ramakkalmedu wind engergy project and tourist centre? 12. The first malayali woman to become Chief Justice of the Kerala High Court? 13. Name the person who commissioned the Puthuvaipin LNG Terminal in 2014? 14. The first Chief Minister of Travancore popular Ministry? 16. Cochin State Prajamandal was formed on? 17. Electricity Agitation of Cochin was against the decision of the Diwan? 18. The temple known as "Southern Varanasi"?